As most of the birds of Belize can also be found in Mexico, and having seen most of the birds in Mexico, there were not many new species that we needed to seek out, but we were still keen to bird some of the large rainforest reserves of southern Belize. We tried to access Bladen Reserve and the Columbia River Forest Reserve but access is difficult with permits requiring a large lead time and guides required. 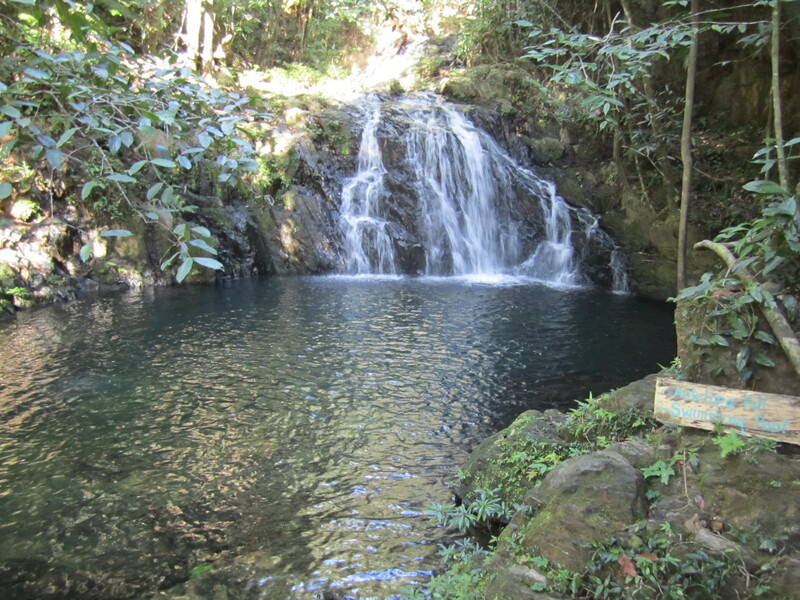 Instead we headed to Cockscomb Basin and Mayflower Bocawina where we sought the Keel-billed Motmot and other rainforest birds. Additionally we spent a couple mornings and evenings looking for crakes and rails in the marshes surrounding Hopkins Village, with limited success. 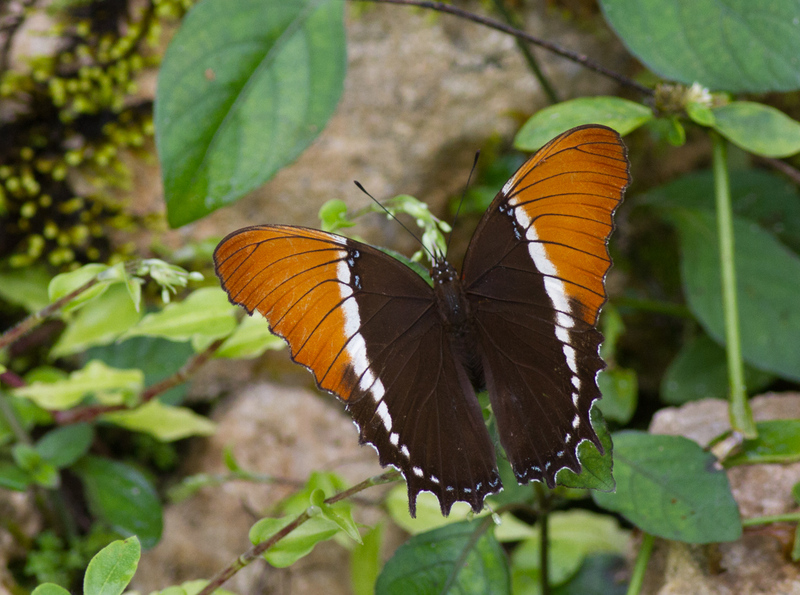 Unknown Butterfly – wish we had room for more field guides! The Keel-billed Motmot ranges disjunctly from Southern Belize to Northern Costa Rica but within that range is found only in large tracts of undisturbed foothill rainforest on the Caribbean slope. 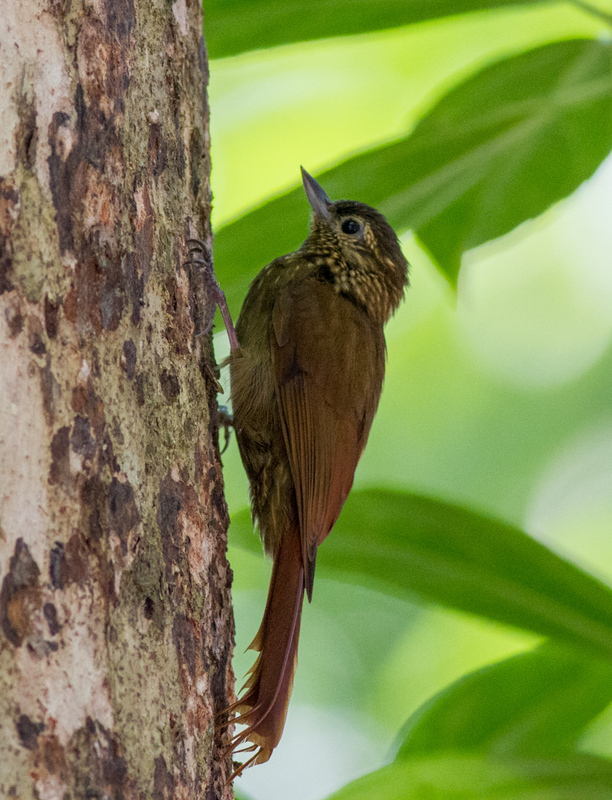 The two best places to find it are in southern Belize and in areas of northern Honduras, but it isn’t easy to see anywhere and requires some hiking and a little bit work as Keel-billed Motmots are rare, deep in the forest, shy, and tend to stay very still in the canopy. Mayflower Bocawina National Park might not sound terribly large at 7000 acres but it joins other reserve areas and the quality of the habitat is great. We were able to camp right at the entrance to the reserve and there was almost no one around. We spent a great morning hiking and birding by ourselves amid several smaller Mayan ruins. 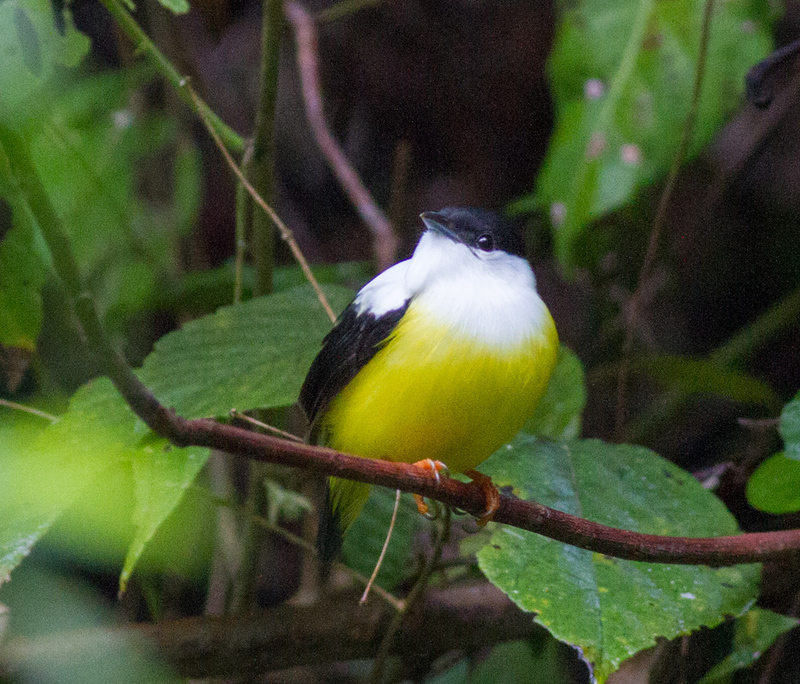 We hiked up the Antelope Falls trail and took a walk on the bird trail, turning up a huge variety of central American rainforest birds. 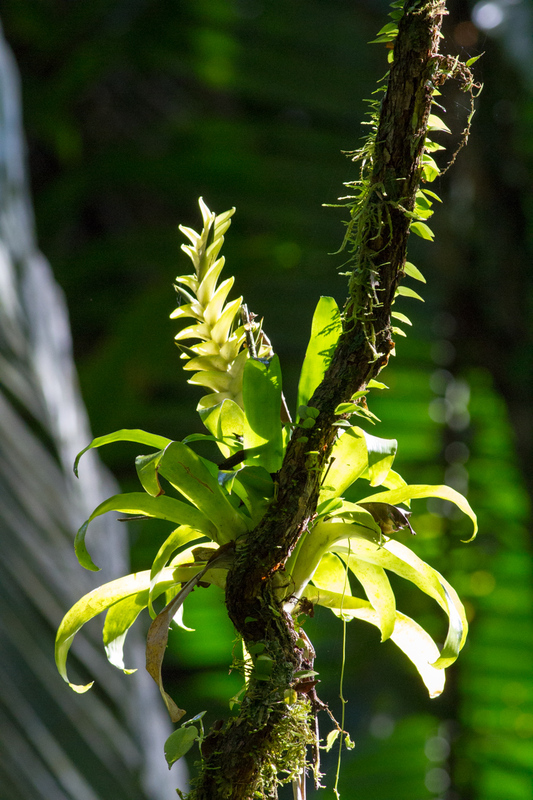 We had not been in tropical lowland rainforest in nearly two months so we had a rough first morning as many of the sounds we were hearing stumped us until we got back on our rainforest game and started remembering all of the calls and songs we learned in the rainforest of Chiapas. We next moved on to Cockscomb Basin where we stayed at the cabins (they are, oddly, no more expensive than camping). We spent 3 ½ days here, birding extensively. The birding here is fantastic and the trails are excellent as well, this was one of our favorite destinations of the trip thus far. We turned up at least 150 species in our time there including, notably, Little, Great and Slaty-breasted Tinamous, White-collared and Red-capped Manakins in huge numbers, Rufous-breasted Spinetail, Crested Guan in large numbers as well, Laughing Falcon, American Pygmy Kingfisher, Buff-throated Foliage-Gleaner, Black-faced (Mexican) Antthrush, Rufous Piha, Rufous Mourner, Yellow-breasted Chat, Rufous-tailed Jacamar, Royal Flycatcher, Gray-headed Tanager, Grey-fronted and Gray-chested Doves, Green Shrike-Vireo, White-whiskered Puffbird, Chestnut-colored Woodpecker and Black-throated Shrike-Tanager. We also went owling and on our first evening, just as the sun was setting and before we could even begin trying for the larger owls, we heard what we thought was a distant Central American Pygmy-Owl. We hiked back down the trail a way and could hear the owl more clearly. We called it in but finding a pygmy owl in 125’ canopy rain forest in the dark is very difficult. The voice is a bit ventriloquial and moreover you’re looking for a very small and very well camouflaged bird that is in the canopy many layers of trees above you. We tried for well over an hour but couldn’t get the owl in the spotlight. We came back the next evening in the late afternoon to give ourselves more time to search for it with daylight, and again heard it calling. A bit of playback again brought it in to our area quickly, but even with ample daylight finding the owl was a nightmare. We searched for a good 45 minutes, during which time I barely saw it (and possibly a partner) flit out of view twice and Kathi saw it in flight once but not terribly well. Just as light was fading I luckily saw it fly in overhead and found the Central American Pygmy-Owl in the canopy and had a very brief view before it unfortunately flew again, before Kathi could get on it. Not wanting to harass the owl further we let it go at that. This guy is certainly much less common and much harder to spot than other Pygmy-Owls as it is more crepuscular or almost nocturnal and, from our experience, tends to stay in the canopy. The following day we planned to hike the Outlier Peak trail to get up into the foothills to continue our quest for the Keel-billed Motmot. We set the alarm for 4AM but it was raining when we woke up so we slept a bit more. We got up at 4:30, got dressed, and it started to rain so we tucked back in for a few. Around 5:30 we got up again and this time managed to get halfway through breakfast before it started raining again, though not too heavily or for too long. We stalled for a bit watching the weather and ultimately decided to leave the camera and recording equipment but bring the rain pants and give it a try, so off we headed on the very muddy trails through spats of rain. Most motmots call only very early and very late in the day and are generally silent otherwise. Unfortunately, with our late start, we didn’t get up into the foothills of the Maya Mountains until 8:30AM or so, well after we might hope to hear one calling, so we used brief bits of playback every few hundred meters as we hiked to try to elicit a response. High up the Outlier Peak trail, above the signed “last stream” and just before the campsite, we finally got a response. 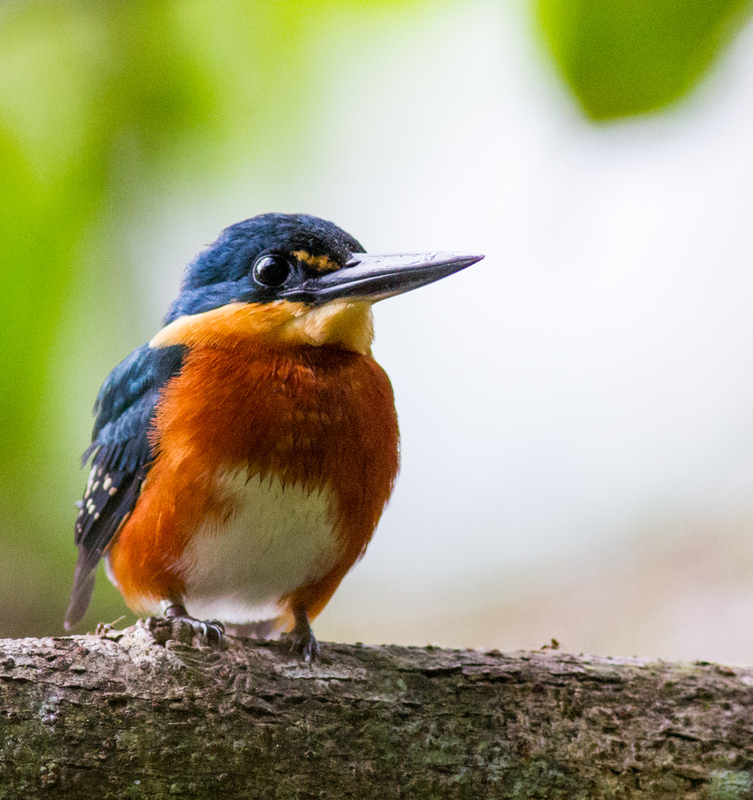 Motmots tend to perch for long periods of time, and the good news was the Keel-billed Motmot was relatively overhead and not likely to fly off soon. But the bad news was it was sitting still and the canopy overhead was a tangle of treetops and layers with poor visibility. A good 30 minutes of sliding and scrambling up and down the steep slopes and craning our necks for angles of view up into the upper canopy finally paid off when I heard Kathi excitedly calling to me that she had found it! 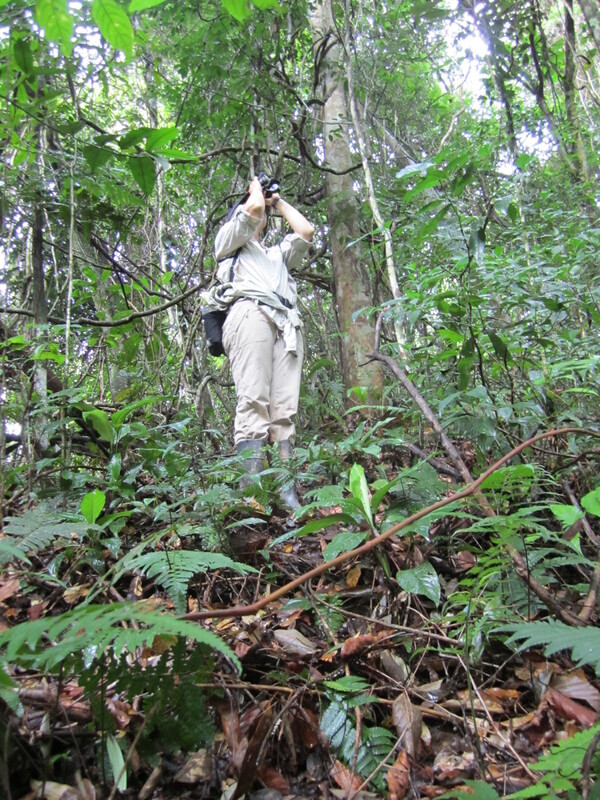 I scrambled and slid across the slope to where she was and sure enough, through openings in other trees that perfectly lined up there was a tiny window into the upper canopy and a perched Keel-billed Motmot who was continuing to call. We were disappointed to not have our camera or recording equipment along but elated to have found this fantastic, rare, and secretive bird. We watched it for at least fifteen minutes before it finally flew. We did our quick celebration dance, ate our lunch and enjoyed birding our way down more slowly where we found about a dozen displaying male Red-capped Manakins as well as a White-collared Manakin lek, a very close Rufous Piha, then later a great mixed species flock with many less common birds. We were very happy to have made the muddy and steep 9 mile hike despite the intermittent rain, though our feet were happy to get out of the rubber boots after 7 hours of sliding up and down the muddy trail in them! We were hoping to get back out to record and get some photos the following morning but instead got absolutely soaked when we bet a second time on the rain abating. However, our spirits were still high from the prior day’s success and thus we didn’t mind too much! While in the general area, we also made a couple of quick trips to the marshes that line the roads into Hopkins and Sitee River. There is extensive freshwater marsh here which looks like excellent rail habitat, and there are records for Black Rail here and Yellow-breasted Crake in other similar habitat in Belize so we thought we would give it a go. Unfortunately, Hopkins is rapidly growing in popularity as a tourism and ex-pat destination which has resulted in a lot of traffic on the road as well as a currently underway road-widening project, both of which made birding a bit challenging and not terribly fun. Not surprisingly, we struck out on Black Rail and Yellow-breasted Crake but we did find Gray-breasted Crake here as well as heard several Clapper Rails. We were surprised to find Clapper Rails there as there are virtually no records in eBird, but we are pretty confident that is indeed what we heard. In addition to rails, we also tried to find Sedge Wren as they do occur in the general area, but no Sedge Wren for us. There is a smaller portion of the same marsh accessible along the much quieter road into Sitee River. However, we did not find any rails there in our brief visit, but it was a bit late in the morning and they surely ought to be present there as well. On our way back up to northern Belize we decided to take the road less travelled… the coastal highway. Highway is a gross overstatement as the road was dirt the entire way but it was in much better shape than the road to Sarteneja. The road initially passes through orange groves and later into extensive grass and pine-oak savannas and finally through tropical scrub. The pine-oak savannas seemed out of place to us since we haven’t been in this vegetation community for quite some time. In the pine-oak area we were at first surprised to see a Hepatic Tanager, not terribly uncommon and not out of range but had been quite some time since we’d last crossed paths with that guy. We also saw several Acorn Woodpeckers, another common bird, but on that always make us smile because they are so goofy and seem to be everywhere there are oaks. On a whim we stopped and tried for Grasshopper Sparrow in the grassland area as we have heard that there are resident populations in Belize. We heard the little tinkling of Grasshopper Sparrow in the grass and after some searching found one scurrying along the ground. In the end we heard several Grasshopper sparrows along the road. While driving along we also spotted three King Vultures soaring high above, another sight we never get tired of. The skies were full of raptors that day. 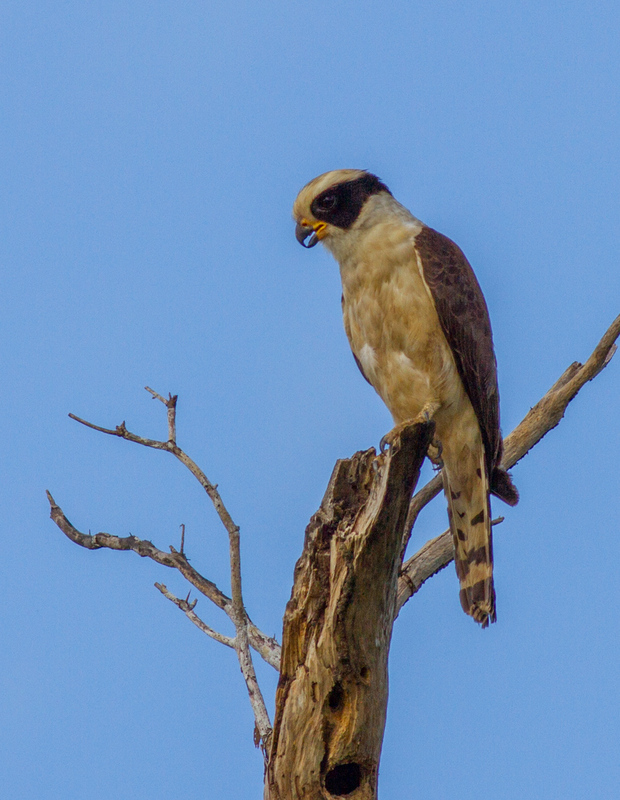 During the drive we also spotted Short-tailed, Roadside, Common Black, and White-tailed Hawks, Bat Falcon, and a couple more that were distant or got away before we could get out of the truck and get bins on them. Thank you Lori! We really wish we had butterfly and herp books along but we’re already overflowing with bird guides for nearly every neotropical country! Love the birding stories on your blog. Some of the best on the web and invaluable for birding in Mexico and Central America (and will be for South America too when you get there). Keel-billed Motmot sure is tough. In Costa Rica, there are some reliable sites for them but they are always outnumbered by the Broad-billed Motmot. A great experience! Have you found any habitat reduction experiences that endangered the species? it’s now a common observation from the bird-watcher.